RGB Accounting is a mobile, dynamic and client oriented organization aiming to help small business owners, entrepreneurs, self-employed professionals & professional corporations to grow their business. We provide outstanding and affordable accounting services, while building up strong and lasting relationships that differentiates us from our competitor. And, we can come to you! Based in Toronto and serving Toronto and the Greater Toronto Area (GTA), RGB Accounting serves the accounting and related needs of small and medium sized businesses. And, we really enjoy working with entrepreneurial start-ups. Furthermore, we are mobile and can come to you! 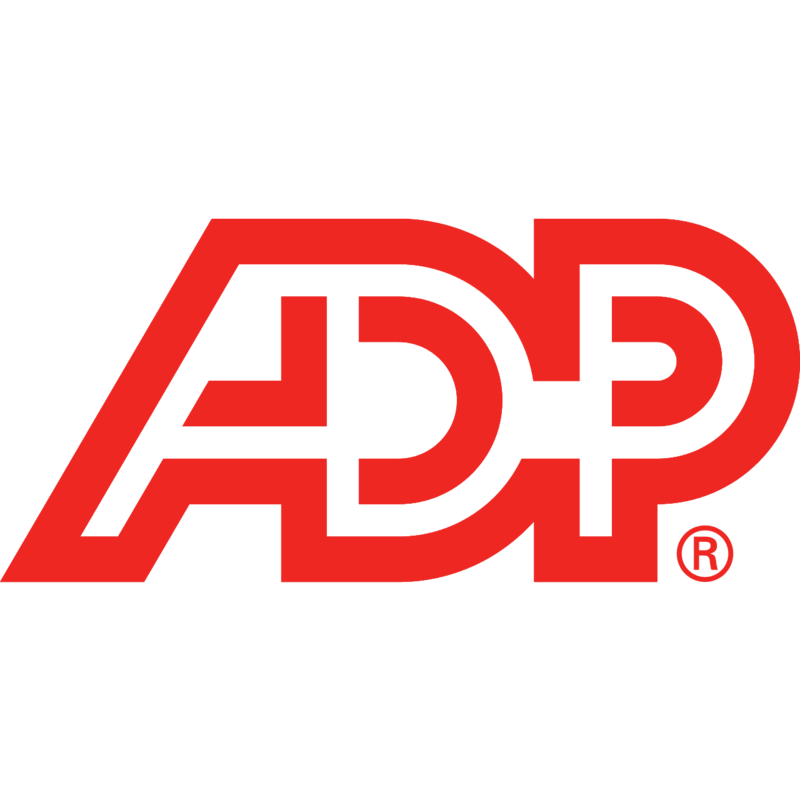 Our services include: accounting, bookkeeping, payroll processing, taxes and related financial issues, plus business advisory services. For each client, these services are tailored to meet the exact requirements and needs of clients and to ensure the most efficient results. Our team is state-of-the-art equipped to respond to financial trends, taxation laws, and regulatory developments. We will help you maximize your business opportunities. A business owner deserves to have up-to-date information about the financial health of the business as all strategic and tactical decisions are ultimately made on the basis of this information. Need to file your personal or small business tax return? We can help you to align your financial goals minimizing your income tax liability. Our specialized team will help you to improve business processes, maximize profitability, and reduce operational costs. We provide advice in the following areas. RGB Accounting is actively engaged in sponsoring events that promote multicultural values and heritage in our community. We enjoy getting in contact with people, listening at their individual or business inquires and offering them tailored and affordable solutions customized to their own needs. 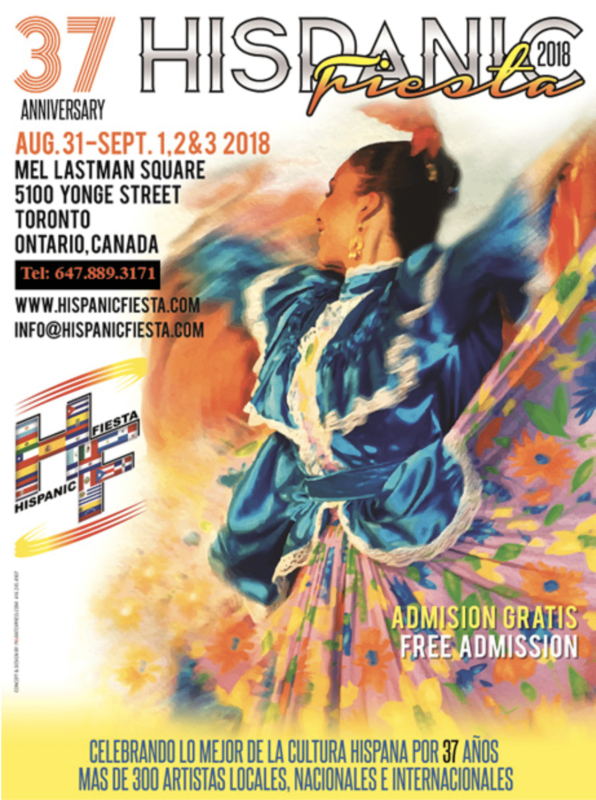 Hispanic Fiesta is a four-day celebration of Spanish and Latin-American arts, food, music and entertainment filled with the splendid sounds, tempting treats and colorful culture featuring 300 local, national and International Hispanic performers from over 20 different Spanish speaking countries. Hispanic Fiesta, a celebration of Spanish and Latin-American: Arts, Food, Music and Entertainment, is a four day celebration filled with the splendid sounds, tempting treats and colorful culture featuring 300 local, national and International Hispanic performers from over 20 different Spanish speaking countries. 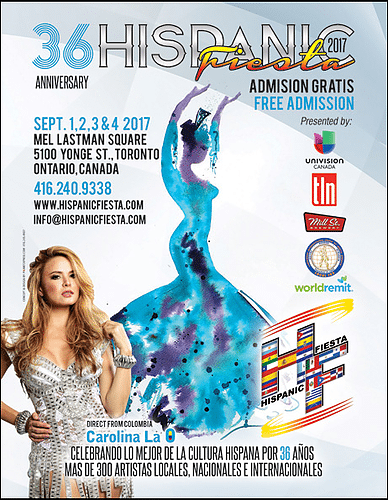 The 36th Anniversary of Hispanic Fiesta took place at Mel Lastman Square in Toronto during the Labour Day Weekend, Sept. 1, 2, 3 & 4, 2017. RGB Accounting proudly participated as a vendor at this event. 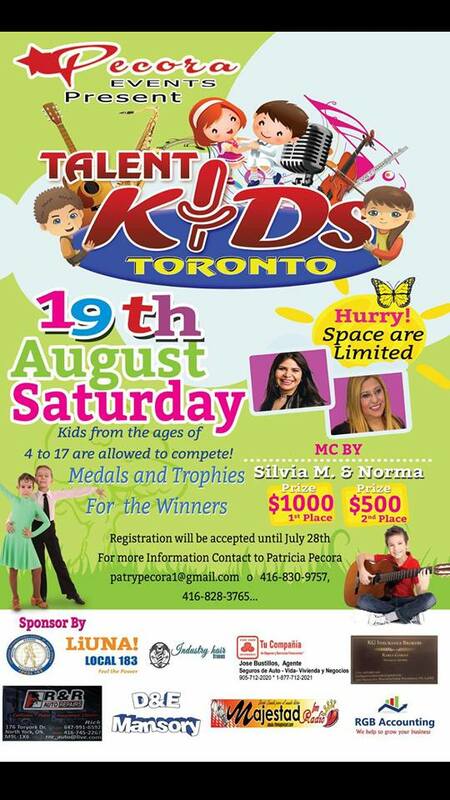 RGB Accounting has proudly sponsored the 2017 Talent Kids event organized by Pecora Events on August 19th. RGB Accounting wants to thanks organizers, presenters, judges, and all participants for making this a great event. Here we share some of the pictures taken during the event. If you participated at the event and you wish to get your high resolution picture with Mickey and Minnie Mouse, please send us an email indicating the number/s of the picture/s and you will get it attached to our email. Thanks! 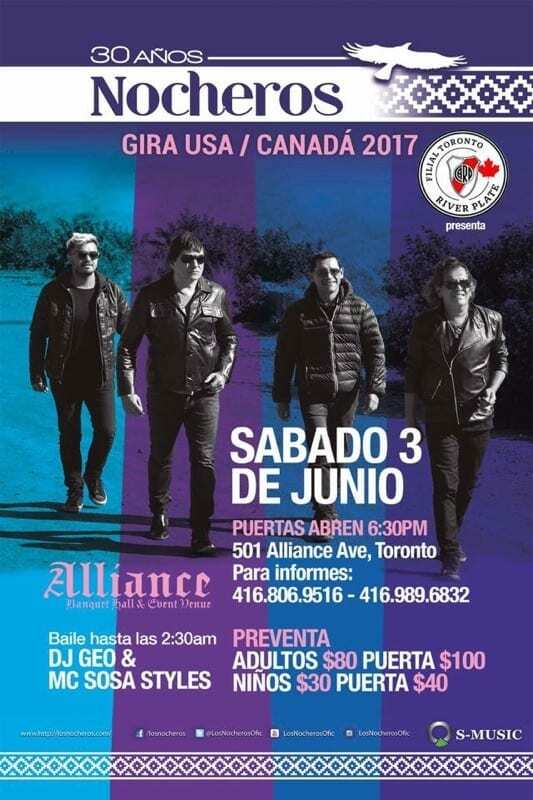 Argentina’s biggest folkloric phenomenon arrived in Toronto, Canada to celebrate its 30 years trajectory. RGB Accounting was one of the sponsors of the event. 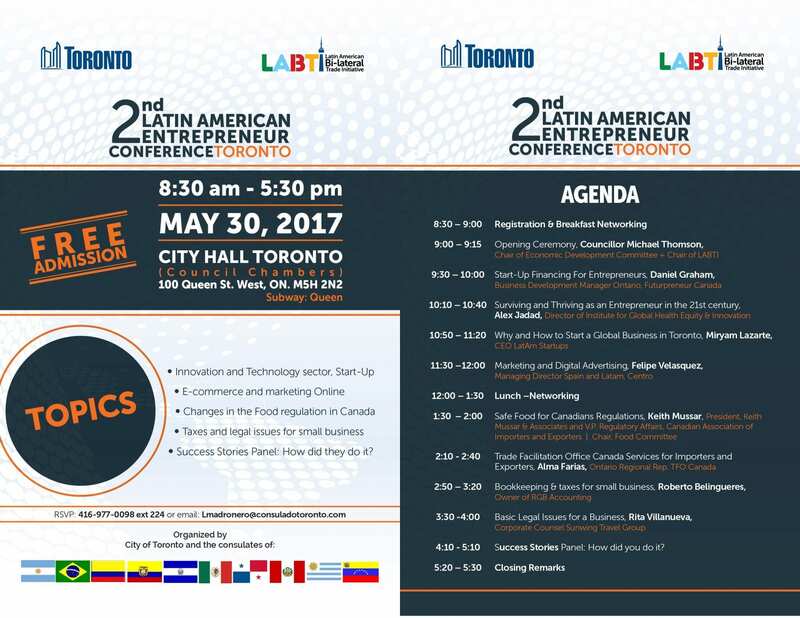 The Entrepreneur Conference was organized by the City of Toronto’s Economic Development & Culture department in partnership with the Latin American Bi-Lateral Trade Initiative (LABTI) which consists of the Consulate Generals of Argentina, Brazil, Colombia, Ecuador, El Salvador, Mexico, Panama, Peru, Uruguay, and Venezuela. 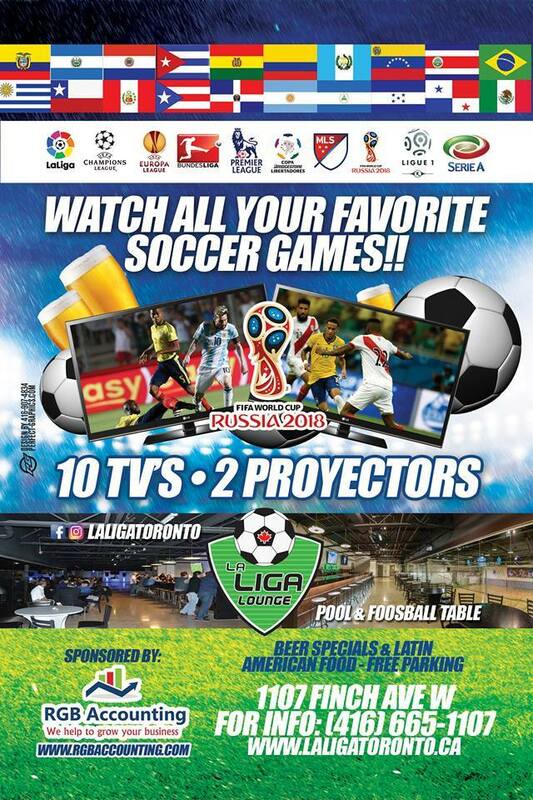 RGB Accounting has been sponsoring social events to promote cultural values in the hispanic community of Toronto and the GTA. The During the last tax season, RGB Accounting helped many individuals and small business owners to prepare their taxes, provided advisory to start-ups, supporting and building strong relationships with them. “RGB Accounting is very professional, flexible, and friendly team of accountants. I sought their help for my uncle's taxes, as he had failed to submit his taxes for the prior year and was late for the current year. Roberto and his partner came to our location and met with me in person to go over the general matter. He completed and submitted both my uncle's tax forms shortly with no issues. I look forward to meeting with him to help my uncle (who is a senior) to get tax strategies for the following year. Roberto is very knowledgeable and dependable. Thanks for all your help. Kindly”. “Roberto is a very enterprising and knowledgeable student while he was studying accounting. His problem-solving skills are immense and highly skilled in using accounting software and computer technology. Those who are using his accounting services will be benefited for sure”. “Very professional company. Would highly recommend and will continue to use in the future”. “Roberto was tremendously helpful, diligent and patient throughout the process of gathering both information and documentation to file my taxes”. “Very professional company. Excellent service. Highly recommended”. What you should know about the NOA?